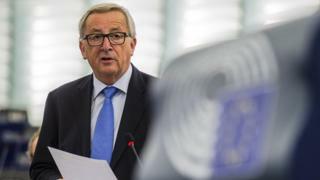 Mr Juncker, speaking at a students forum in Luxembourg, warned it could result in a region too complicated for the European Union (EU) to govern. Spain has been in turmoil since the separatist government in Catalonia held a disputed referendum on 1 October. The vote, declared invalid by Spain's top court, had a 43% turnout. Almost 90% of voters backed independence, Catalan officials say, resulting in Catalan leader Carles Puigdemont signing a symbolic declaration of independence on Tuesday. However, he then suspended its implementation to allow several weeks for talks with Madrid. Madrid, in turn, has issued its own ultimatum, with Spanish Prime Minister Mariano Rajoy giving Mr Puigdemont five days to explain whether or not he has declared independence. If Mr Puigdemont confirms by Monday that he has, he will be given a further three days to withdraw the declaration. If this does not work, Madrid has threatened to invoke Article 155 of the constitution, allowing Spain to suspend Catalan autonomy and impose direct rule. Speaking at Luxembourg University on Friday, Mr Juncker urged Mr Rajoy - who has described the current situation as the most serious threat to Spain's democracy in its 40-year history - to bring the situation under control. The EU has made clear that, should Catalonia split from Spain, the region would cease to be part of the EU. It has also made it clear the issue of independence was one for Spain. However, Mr Juncker was open with his own views on the issue. "If we allow, but it's not our business, that Catalonia becomes independent, others will do the same and I wouldn't like that," he said. "I wouldn't like a European Union in 15 years that consists of some 90 states."